I want to see B.Ed. 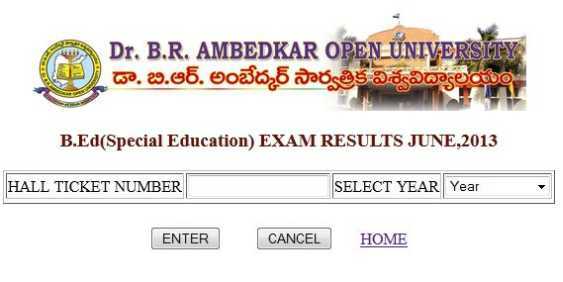 exam result of Dr Br Ambedkar Open University so how can I see it? Click on Examination Result at homepage of Dr Br Ambedkar Open University Homepage. Click on Click Here in front of B.Ed(SE) I,II Year Exam Results,Dec-2012. Last edited by Aakashd; August 4th, 2018 at 06:35 PM. Dr. B. R. Ambedkar Open University is a public university in the city of Hyderabad, Telangana, India. It was established in 1982. it is approved by UGC. Go to the official website of Dr. B. R. Ambedkar Open University. On this page you will get the result.